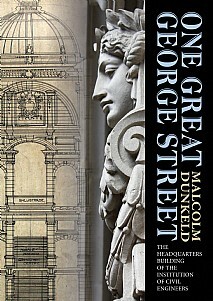 This book is the most thorough study yet undertaken of the headquarters building of the Institution of Civil Engineers in Great George Street, London, SW1. It considers how the building visually represents the authority of the profession and discusses not only the architecture and technology of the building but also the social relationships that underpin the structure. Few headquarter buildings associated with the professions have been subject to serious historical study; in effect they are anonymous buildings passed by each day almost without comment. The aim of this study is to show that such buildings have a story to tell, that they and their contents are more than just ‘mute objects’ but give valuable insights into the organisation occupying the building. The Great George Street building, which was constructed over a thirty-seven month interval from 1910 to 1913, is surprisingly barely mentioned by architectural historians and received only briefest acknowledgement in the building press of the day. The story has relevance to all those other professional associations that occupy a large headquarters building or council chamber and anyone who is interested in architecture and construction history. The book contains fascinating archive material and discusses the technology of one of the earliest steel frame buildings in England. Furthermore it investigates social relationships and the role of Freemasonry in the Edwardian building world. The book will be of interest to anyone with an interest in architecture, construction history and civil engineering including, of course, members of the Institution who wish to know more about their building.